The front suspension on your car is what stabilizes the car to the road especially around curves and helps absorb the bumps of the road. 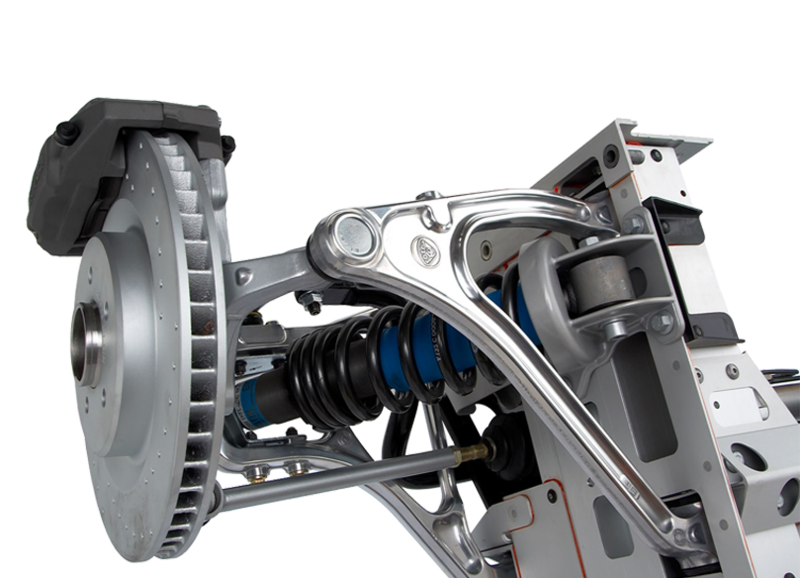 Front suspension parts on most cars include parts like control arm assemblies, struts, stabilizer bar, CV joints, tie rods, idler arm and or radius arm and steering knuckles. When you notice a problem, the steering wheel may wobble or the front end may clunk, click, squeak or bounce as you drive down the road. These are symptomatic of these parts being worn out. Even loose or worn bushings in the control arms or other front suspension parts require replacement by a qualified technician. At Guy’s Automotive, we can fix, repair, or replace all front end types of problems. Some models of motor vehicles require strut replacement when cornering becomes difficult and the car or truck bounces repeatedly on a bumpy road. An excellent test for struts is to push with your hand on the end of a fender as far down as you can and let up on it. 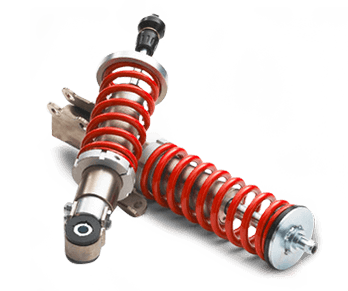 If the car bounces more than once then a strut or shock replacement is needed. The stabilizer bar is an important part of the front suspension because it keeps the control of the vehicle during moderate to fast driving speeds around a curve. Without a stabilizer bar, your car would sway side to side and you may loose control of your vehicle. All stabilizer parts can be checked, ordered and replaced at Guy’s Automotive. A complete ball joint inspection comes with an oil change and a lube of those ball joints with a tire rotation included at Guy’s Automotive. Worn out ball joints can cause the front end of a vehicle to do damage to the tires like uneven tire wear, or possibly cause a wheel to fold if the ball joint breaks. Guy’s certified front end mechanics can replace worn out on all makes and models. Idler arm and tie rods are what connect your steering to your wheels. A worn out idler arm or tie rod end can cause poor road feel as you steer the vehicle or sloppy steering. Worn out parts will also cause uneven tire wear that can result in premature tire replacement. Guy’s Automotive can replace tie rods, idler arms, steering boxes or rack n pinions. Springs, especially on older model heavier weight vehicles, can cause your car to sag. Old springs can often accordion with a heavy load or with several passengers on board and can cause the vehicle to bottom out over bumps creating a dangerous situation as far as control is concerned. The springs can be inspected with a tire rotation at Guy’s Automotive to determine if the springs are worn out and need replacing. Worn CV joints are characterized by a humming or clicking noise on front wheel drive vehicles. CV joints distribute the torque from the transmission to the wheels. If a CV joint breaks, your car will not be drivable. Guy’s Automotive can inspect or replace your CV Joints. Steering knuckles connect the rack and pinion mechanism to the steering column. When the knuckles wear out the steering on your vehicle becomes unpredictable and turning will be a problem. Guy’s expert mechanics can troubleshoot and replace worn steering knuckles and restore your steering. If you have any front suspension problems, call Guy’s Automotive and make an appointment to have your vehicle checked out. We have the tools, equipment and experience to repair all your front suspension problems.